soit 4.64 fois plus qu'en 2009 !! et pourrait fort mener à de nouveaux plus hauts , la chine se présentant comme un compétiteur aussi important que l'inde , pour l'importation d'or. On Wednesday gold put in a secondary high up some $9.10 in Feb gold around 12-05PM and then spent the afternoon declining. It settled at $1388.30, up $2.20 and by the stock market close had added 30c to stand 1.23% above Tuesday’s 4PM level. Estimated volume was 154,578 lots which was quite evenly spread throughout the day. Closely scrutinized, the gold shares responded to this very constructively. Bottoming during the usual early sell-off down 0.21% and up 0.21% respectively, the HUI and XAU ignored gold’s later weakness, firmed throughout the afternoon and closed shortly after and only slightly below their highs, up 1.29% and 2.02%. This is a bullish signal. Reflecting the positive tone, the junior gold ETK GDXJ outperformed the senior +2.03%/1.31%. The bullion vehicles did not confirm. CEF slipped to a 7.4% premium to NAV and PHYS to 3.5% (9.3% and 3.98%). The GLD ETF reported adding a sizable 7.2887 tonnes to 1,293.89138 tonnes. MarketVane’s Bullish Consensus for gold added a point to 77% but the HGNSI was unchanged at 46.9%. Early on Thursday morning local Vietnam gold stood at a $9.23 premium to world gold of $1,391.30 (Wednesday $12.80/$1,388.38). If memory serves, this is the first even semi-official quantification of Chinese gold imports. JBGJ has always been skeptical of the Chinese demand story in world gold price formation, on the grounds that Chinese production growth has kept pace with reported consumption - and a 45 tonne import number for 2009 vindicates this stance. Vietnam probably smuggled in a similar amount. But 209 tonnes in 10 months is a horse of a different color. It substantially exceeds the quantity implied last week when Hong Kong reported exporting 117 tonnes to China by the end of August this year. (The trade will be surprised that HK’s share of Chinese imports is so low.) It means China might actually be capable of getting into India’s league as an importer. Equally important is: why the sudden acceleration? It is not because of a slump in Chinese output (Chinese gold output was reported to be up 8.83% at 277.017 tonnes in the first 10 months of 2010 this morning). Could it be that there actually is an inflation scare sweeping China – the reason the SGE chairman cites for the inflection?- Could the strangely high Shanghai gold premiums actually be real, and possibly reflect impediments of some kind in importing physical? This appears to be the most important gold news since the massive Indian IMF purchase was announced was announced in November last year. It also could well trigger new highs in world gold. At current rate of demand growth China will surpass India as the world's biggest gold consumer within the next 2-3 years with the two nations taking some 40% of world production. LONDON (Commodity Online): Till now India used to be the numero uno as far as gold demand is concerned. However, the pattern is now changing. Now, the global bullion markers are watching China also keenly as the dragon nation’s appetite for gold has seen a sea change during the past few years. At this current pace, private Chinese demand may overtake India’s by 2014, giving the world’s two most populous nations two ounces of gold in every five sold worldwide that year. But already, this further eastwards shift is showing in global gold prices. Coinciding with the post-harvest wedding and festival season, Indian demand typically peaks with Diwali, the biggest festival in India, in November. Chinese households, on the other hand, ramp up their gold buying around Chinese New Year (starting on February 3 in 2011) – and as the hump in global demand is moving from Diwali to Xīn Nián, so too is the annual peak in the global gold price. India began liberalizing Indian gold prices and retail sales in 1990, after imposing strict controls in 1968. During the global bear market in gold which then continued to 2001, average dollar prices between September and November bucked that trend, rising even as the underlying direction was down. Beijing started liberalizing its domestic gold market a decade ago, first with the end of jewellery price controls in 2002, and then with the launch of Shanghai’s bullion-trading exchange in 2005. Diwali has since lagged the average quarterly gain during this current bull market, whereas the following three months, in contrast – the period leading up to and including China’s New Year and Lantern Day festivals a fortnight later – have strongly outperformed, and by a widening margin as liberalization has broadened. Indian households remain the world’s No.1 gold buyers for now, as they have been since the mid-20th century and before. But nearly 16% of global gold demand went to Chinese households between July and October this year, rising from the previous three-year total of 14%. And, Chinese consumers are already making a big impact on global gold prices. Chinese savers have bought almost half as much gold since the global financial crisis began in mid-2007 as all investors living in the developed West. Private Chinese consumers bought as much gold in the last two-and-a-half-years as the People’s Bank of China owns in total. Both Indian and Chinese households are also switching to more efficient forms of gold investment too, continuing to accumulate jewelry but choosing coins and gold bars for a growing chunk of their holdings. On parle quand même de plus du tiers de la population mondiale...dans des pays en forte croissance (à faire pâlir l'occident). quand aux importations d'argent métal, par la chine, elles ne sont pas en reste ! le paralléle entre les importations chinoises (courbe rouge ) et le cours de l'argent métal ( courbe bleue ) est fort interessant ..==> les courbes sont quasi calquées ! SINGAPORE -- China's Lion Fund Management, which last month launched the first gold fund in the world's biggest producer of the metal, has met its goal of raising $500 million for the fund, the company said in a statement. The company won regulatory approval for the fund under the country's Qualified Domestic Institutional Investor scheme, which allows Chinese money to be invested overseas. It plans to invest in gold-backed exchange-traded funds on the global market. It was the biggest QDII fund in the last three years, thanks to investors' enthusiasm for gold, the company said. Inflation worries and limited investment options have fuelled demand for gold from Chinese investors, especially as the precious metal staged a stellar record-breaking rally in 2010. China, the world's biggest gold producer, is catching up with India, with demand this year expected to surpass 600 tonnes. les importations argent métal de la chine explosent en 2010 .. 4 fois celles de 2009 ! les importations 2010 représentent 4 fois celles de 2009 et atteignent un nouveau plus haut historique..
la chine a importé 209 t d'or pour les 10 ers mois de 2010 tandis que l'inde en importait 333T sur une année pleine. China's gold imports are estimated to have more than doubled from a year ago in the run-up to Chinese new year, putting the country on track to overtake India as the world's largest consumer of the precious metal. The growth in demand is being attributed in part to Chinese families giving each other gifts of gold instead of traditional red envelopes filled with cash. Fears of inflation have also driven demand for gold as a retail investment. Precious metals traders in London and Hong Kong said on Wednesday they were stunned by the strength of Chinese buying in the past month. "The demand is unbelievable. The size of the orders is enormous," said one senior banker, who estimated that China had imported about 200 tonnes in three months. Gold prices softened in January on the back of positive economic data in the US, but prices for physical gold in Shanghai have been at a premium of about $20 per troy ounce over those in London, underscoring the tightness in Asian markets. That spread fell to $4 on Wednesday because of slow trading during the new year. Official data show China importing 209 tonnes of gold the first 10 months of last year, versus 333 tonnes for India for the whole year. The Indian festival of Diwali was once the key driver of seasonal demand patterns because of the large number of weddings taking place during the holidays. But now, as India's gold demand has started to smooth out because of changing wedding habits, Chinese new year is starting to have a bigger impact. Last year about a third of Chinese gold consumption was linked to the holidays, according to a precious metals trader, but this year the spike is more pronounced. Gold gifts are more popular in China this year than ever, particularly rabbit-themed gold pieces to mark the year of the rabbit. Small bars of 100 ounces or less are elaborated engraved with auspicious rabbit idioms or scenes of rabbits at play. A gold store in Tangshan, a mid-tier steel town near Beijing, was all but sold out of rabbit-themed products on a recent visit. With about a five days to go before the start of the holidays, the store clerk said all that was left in stock was a 20-oz carved rabbit bar and a few leftover Bugs Bunny-style statuettes. Edel Tully, precious metals strategist at UBS, said: "China is on the fast track to replace India as the largest physical consumer. And the Chinese new year is now significantly more important than Diwali in volume terms." China consumes about 527 tonnes of gold a year, according to the World Gold Council, an industry body representing gold miners. Traders say China will overtake India as the largest consumer of gold this year. "The seasonality around Chinese new year is something that we've seen in the last two to three years," said a senior trader in Asia. "This year the demand may actually also carry on after Chinese new year." This week China's exchanges are closed for the holidays and traders are debating how much of the growth in imports has been seasonal and how much is a result of underlying demand. Gold has become popular with retail investors as a hedge against inflation because of curbs on the property market and negative real interest rates for Chinese bank deposits. 2005, they were net exporters of 100 million ounces," he says. all going to come from? We don't know." Il vise un ratio Silver/Gold de 16 pour 1. Et Un objectif de 1600$ sur le gold en 2011...soit pas moins de 100$ le silver. 2011, l'année du lapin...mais pas crétin ! SHANGHAI -- Demand in China for physical gold and gold-related investments is growing at an "explosive" pace and its appetite for the yellow metal is poised to remain robust amid inflation concerns, an Industrial and Commercial Bank of China executive said. ICBC, the world's largest bank by market value, sold about 7 tonnes of physical gold in January this year, nearly half the 15 tonnes of bullion sold in the whole of 2010, said Zhou Ming, deputy head of the bank's precious metals department on Wednesday. "There is also frantic demand for non-physical gold investments. We issued 1 billion yuan worth of gold-price-linked term deposits in 2010, but we managed to sell the same amount over just a few days in January this year," Zhou said, adding that such deposits would easily exceed 5 billion yuan ($759 million) this year.Gold imports into China soared in 2010, turning the country, already the largest bullion miner, into a major overseas buyer for the first time. The surge, which comes as Chinese investors look for insurance against rising inflation and currency appreciation, puts the country on track to overtake India as the world's top gold consumer and a significant force in global gold prices. China’s central bank will produce more than double the quantity of gold Panda coins this year than it had planned, in response to a surge in buying from Chinese investors. The increase in production is "to meet the needs of collectors", the central bank said in a statement posted on its website. Rising inflation in China and other Asian countries has inspired a surge in gold investment this year, according to bullion dealers, as investors turn to hard assets such as precious metals as a means of wealth preservation. The People’s Bank of China said it would boost the circulation of the popular Panda coins, China’s official bullion coin, to 1.06m ounces in 2011, from about 500,000 ounces planned at the start of the year and 400,000 ounces last year. In addition, it plans to raise production of silver Pandas to 6.4m ounces from its earlier plan of 3.4m ounces. Although gold and silver coin buying accounts for a relatively small slice of overall demand, traders see it as an important leading indicator of sentiment. While some investors in the west have been cutting their exposure to precious metals amid concerns that tightening monetary policy around the world could mark the end of the decade-long rally, investors in Asia have been pouring in more money than ever. "The amount of blanks that are being produced for the Chinese to mint these gold and silver coins has increased quite significantly," he said. "Panda coins are even being shipped back from western markets to China." The increase in supply means the Chinese Panda coin could overtake the South African krugerrand and the Austrian Philharmonic, two of the best-known bullion coins, in terms of production. The American Eagle, produced by the US Mint, is the leading investment coin. The 2011 Panda coins, which are legal tender in China, carry an image of the Temple of Heaven in Beijing on one side and a depiction of a mother panda and her cub on the other. China overtook India to become the largest market for gold bars and coins in the first quarter of this year, according to the World Gold Council. Mr Klapwijk said he expected Chinese demand for gold bars – which account for the majority of physical investment – to rise at least 40 per cent this year. The surge in precious metals buying from China has helped support prices even as western investors are doubtful. Gold has remained within reach of its nominal record high of $1,575 a troy ounce, trading at $1,545 on Tuesday, while silver has stabilised at about $36 a troy ounce after a sharp fall. "If prices were to drop below $1,500, the Chinese market would ignite," Mr Klapwijk said. Walter de Wet, head of commodities research at Standard Bank in London, said: "We have seen exceptionally strong physical gold demand so far this year compared to the same periods in 2009 and 2010. We believe that this will provide support for gold on dips." en 43 combien de fois 6 ? Vous avez bien lu...7 fois le ratio actuel ...!!! Chinese gold imports from Hong Kong, a proxy for overseas buying, hit a fresh record high in October and accounted for more than one-quarter of global demand. Data from the Hong Kong government showed that China imported 85.7 tonnes of gold via Hong Kong in October, up 50 per cent from the previous month and up more than 40 times from October last year. It is the fourth consecutive month that China’s gold flows through Hong Kong have hit new highs. Tom Kendall, precious metals analyst at Credit Suisse in London, said: "It is a big but credible number as the price arbitrage between London and Shanghai was definitely favourable for Chinese imports during late September and throughout October." In September, gold on the Shanghai Gold Exchange briefly traded $50 an ounce higher than the main global market based in London, a record price difference that encouraged imports. China’s demand for gold has been surging this year as Chinese buy more gold jewellery and gold bars. Gold bars are popular investments as a hedge against inflation, and because the Chinese face limited options for other investments given China’s negative real interest rates on bank deposits and wobbling property prices. Mr Kendall predicted overall Chinese imports of 470-490 tonnes for the full year, up from 245 tonnes last year. Some traders believe China’s imports could hit 500 tonnes, more than the production of Australia and South Africa combined. However, analysts said that buying from China and other emerging economies had fallen sharply since October, as the weakness of their currencies against the dollar had made gold more expensive. The difference between London and Shanghai gold prices has fallen to almost zero. The price of gold on Monday fell 2.7 per cent to $1,664.19 a troy ounce amid concerns about a tailing off of emerging market consumption, together with a downbeat market assessment of the outcome of last week’s European leaders’ summit. China’s key gold-buying period is around Chinese New Year, which falls at the end of January, and China’s gold shops are already filled with dragon-emblazoned gold bars, coins, and figurines to give as gifts for the year of the dragon. Beijing has also encouraged the use of gold as an investment tool for Chinese savers given the limited investment options and China’s closed capital account. China is the world’s second-biggest consumer of gold, after India, but is expected to take the top spot soon. This year China’s imports via Hong Kong during the first 10 months of the year are more than three times higher than the same period last year. Beijing does not publicly disclose its gold imports, but analysts consider the Hong Kong import figures a good directional proxy for the country’s total gold overseas buying. record hausse des importations d'or chinoises ! l'importation d'or par la chine , en record de hausse ! +50% par rapport au mois dernier et tenez vous bien , +4000 % sur l'année ! As a reminder to evolving drama in the gold market, WikiLeaks exposed China’s plan to break from its sadistic recycling of trade surpluses into U.S. Treasuries, a shift in strategy by Beijing that’s prompted other Asian nations to follow suit. See BER article, WikiLeaks Drops Bombshell on gold Market, GATA right again!Source: U.S. embassy cable – 09BEIJING1134According to China’s National Foreign Exchanges Administration, China’s gold reserves have recently increased. Currently, the majority of its gold reserves have been located in the United States and European countries. The U.S. and Europe have always suppressed the rising price of gold. They intend to weaken gold’s function as an international reserve currency. They don’t want to see other countries turning to gold reserves instead of the U.S. dollar or euro. Therefore, suppressing the price of gold is very beneficial for the U.S. in maintaining the U.S. dollar’s role as the international reserve currency. China’s increased gold reserves will thus act as a model and lead other countries toward reserving more gold. Large gold reserves are also beneficial in promoting the internationalization of the renminbi.And the promotion of the "internationalization" of the renminbi has noticeably accelerated this year. On a year-over-year basis, the amount and rate of increase of gold purchases by the People’s Republic of China is no less impressive than the $3.2 trillion of foreign reserves slated to be deployed by Beijing. la Chine va t'elle devenir, devant l'inde, le 1er importateur d'or? Did China just overtake India as the world’s largest gold consumer? Little more than a year ago it would have been almost laughable to ask that question. In 2010 India’s gold consumption was a full 46 per cent – or 275 tonnes – higher than China’s, according to data from consultants GFMS published in the World Gold Council’s quarterly reports. But data released in the last few days suggests that China may have closed the gap, inching ahead of India in terms of overall gold demand in 2011. Some of us had predicted this, but the data are sketchy, questionable, and incomplete, so it remains a hypothesis at this stage. GFMS is releasing updated – but not final – 2011 data on Tuesday, while the WGC should publish fourth quarter numbers in mid-February. Chinese gold imports from Hong Kong – which in past years have accounted for about half of the country’s total imports – have soared to unprecedented levels. 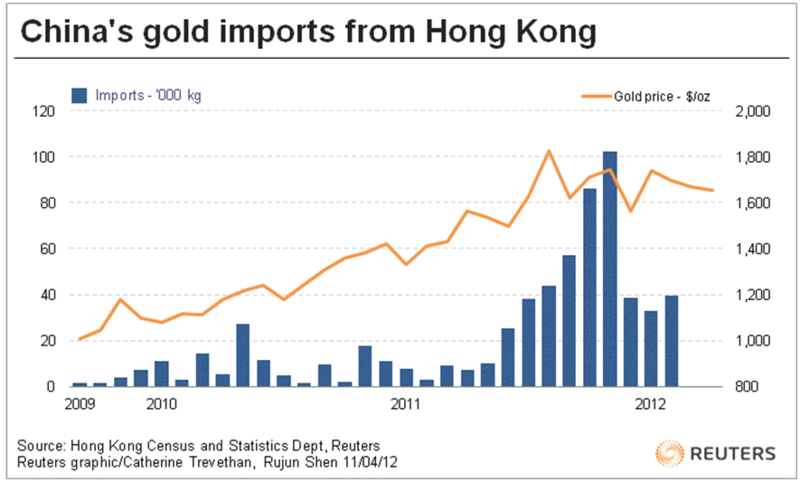 In October and November, China imported 189 tonnes of the precious metal from Hong Kong. Add to that China’s domestic production, which runs at a rate of about 90 tonnes a quarter, and even without including any buying in December or any imports from sources other than Hong Kong, Chinese demand in Q4 would stand at a minimum of 279 tonnes. The president of the Bombay Bullion Association told Reuters that Indian gold imports in the fourth quarter of 2011 tumbled by more than 50 per cent to 125 tonnes. Since India has almost no domestic production, that number, if correct, is also India’s overall gold demand in Q4. Put all the numbers together, and they imply that full year Chinese demand in 2011 was at least 891 tonnes (and probably a good deal more), while Indian demand was just 868 tonnes. Bingo! China wins! We shall only know for sure when better data come out in the next couple of months. Regardless, though, one thing is sure: it is hard to overstate the significance of the increase in Chinese gold demand. <p>Analysts believe China bought as much as 490 tons of gold in 2011, double the estimated 245 tons in 2010. "The thing that’s caught people’s minds is the massive increase in Chinese buying," remarked Ross Norman of Sharps Pixley, a London gold brokerage, this month. la différence serait donc uine augmentation des réserves d'or de la banque centrale chinoise. The World Gold Council believes China's central bank made significant gold purchases in the final months of 2011, contributing to a surge in the country’s imports. Marcus Grubb, managing director for investment at the WGC, a lobby group for the gold mining industry, told the Financial Times that buying by the People's Bank of China could explain a large discrepancy between Chinese imports and the WGC's estimates of consumer demand in the country. "There is absolutely a discrepancy in the import figures," said Marcus Grubb. "The obvious inference is that the central bank is buying." His comments mark the first public statement from a senior gold industry executive pointing to purchases by the Chinese central bank, a trend that many others have highlighted privately. The PBOC did not respond to questions on Thursday. China's imports from Hong Kong, which account for the majority of its overseas buying, soared to 227 tonnes in the last three months of 2011, according to data published by Hong Kong. Mine production in the country, the largest gold producer, stood at about 100 tonnes in the quarter, implying total supply of at least 330 tonnes. That compares to demand of 191 tonnes for gold jewellery, bars, and coins -- which account for the vast majority of Chinese demand -- reported by the WGC on Thursday. Most industry executives believe China has been quietly accumulating gold produced in its domestic market for years, but it rarely publishes details of its holdings. In 2009, Beijing revealed it had almost doubled its gold reserves since 2003, making it the fifth-largest holder of bullion with 1,054 tonnes. Philip Klapwijk, head of metals analytics at Thomson Reuters GFMS, the consultancy that produced the data underlying the WGC report, agreed that the so-called "official sector" of the central bank and other sovereign institutions may have bought gold in the final quarter of the year. "It could be that the apparent surplus in the domestic market due to the scale of imports reflects official sector purchases," he said. However, he added that some of the apparent surplus could be accounted for by stockbuilding by Chinese banks ahead of the lunar new year holiday. Mr Grubb added that the Hong Kong trade data could yet be subject to revisions, or that other players, such as Chinese sovereign wealth funds, or other financial institutions, could have accumulated stocks of gold during the quarter. But he added: "In the medium term we do know the Chinese central bank and other Asian central banks with large foreign exchange reserves have been increasing their holdings of gold. This is consistent with that." Central banks bought about 440 tonnes of gold last year on a net basis, the WGC said, the highest level of buying since 1964. Large buyers included Mexico, Russia, and South Korea. China's State Administration of Foreign Reserves, which manages China’s $3.2 trillion in foreign reserves under the Central Bank, has said publicly that it views gold and other commodities as having limited relevance for its investments because of price fluctuations, storage costs, and limited transaction volumes. However, advisers to the central bank have been urging China to diversify its holding of foreign reserves, which is held mostly in US Treasuries and other governments' bonds. Demand from Chinese consumers is also rising rapidly, as they pour newfound wealth into gold. The WGC on Thursday predicted that China would this year overtake India as the world's top gold consumer for the first time. Chinese gold demand remains very strong as seen in the importation of 40 metric tonnes or nearly 40,000 kilos of gold bullion from Hong Kong alone in February. Hong Kong’s gold exports to China in February were nearly 13 times higher than the 3,115 kilograms in the same month last year, the data shows. Shipments were 72,617 kilograms in the first two months, compared with 10,564 kilograms a year ago or nearly a seven fold increase from the record levels seen last year. China’s appetite for gold remains strong and Chinese demand alone is likely to put a floor under the gold market. Mainland China bought 39,668 kilograms (39.668 metric tons), up from 32,948 kilograms in January, according to export data from the Census and Statistics Department of the Hong Kong government. Demand has picked up again after the Lunar New Year and demand has climbed in China as rising incomes and concerns about inflation lead to store of value buying. There is also a concern about the Chinese stock market which has gone sideways since 2001 (see chart) and increasing concerns that various property markets in China look like bubbles ready to burst. Consumer demand for gold beat India for the first time in almost three years in the fourth quarter and China may replace India as the biggest buyer annually this year. The massive gold purchases may signal the People’s Bank of China is continuing to secretly accumulate gold reserves. Reuters report that there are suspicions that the number could include purchases from the public sector, as the market was largely quiet during a post-Lunar New Year holiday slump in February. "On the public level, China's central bank will continue to accumulate gold, which is easier than liberalising their capital account and currency," said Friesen of SocGen, adding that building gold reserves would help China's push to turn the renminbi into a global currency. Accommodative monetary policy will remain an incentive for private investors to buy into gold, he added. The nation last made its reserves known more than two years ago, stating them to be 1,054 tons. The PBOC’s gold reserves remain small compared to those of the Federal Reserve and many European nations. Their gold reserves remain tiny when compared to their massive foreign exchange reserves of $3.2 Trillion. It is important to note that in past years, Hong Kong gold imports have accounted for about half of China's total gold imports. China itself doesn’t publish gold import data and the very high and increasing demand from Hong Kong is only a component of overall Chinese demand. The per capita consumption of 1.3 billion people continues to increase from a near zero base meaning that this is indeed a paradigm shift and not a blip or ‘flash in the pan’. It means that gold will likely see record nominal highs - possibly before the end of the year. Prudent western buyers wishing to protect and grow wealth will again buy gold on the dip as the Chinese are doing. the very high and increasing demand from Hong Kong is only a component of overall Chinese demand. la demande très élevée et croissante de Hong Kong n'est qu'une composante de la demande chinoise dans son ensemble. La consommation par habitant de 1,3 milliard de personnes continue d'augmenter à partir d'une base proche de zéro, ce qui constitue effectivement un changement de paradigme et non pas un blip ou «flash . Cela signifie que l'or va probablement voir des records nominaux - peut-être avant la fin de l'année. Les prudents acheteurs occidentaux désireux de protéger et développer leur richesse seront de nouveau acheteurs d'or sur les faiblesses du marché: c'est ce que font déjà les Chinois.